The 300th hybrid London bus is now in service on route 211 between Waterloo and Hammersmith. A further 104 hybrid buses are on order using £5m funding from the Department for Transport. This grant was initially set to finance 70 buses, but Transport for London has managed, through good negotiation and increased market confidence in hybrid buses, to secure Green Bus funding so that, in total, over 400 of these less polluting vehicles will be in service by next year. In addition the Mayor of London has committed to taking delivery of 600 of the New Bus for London vehicles, seven of which are already in service on Route 38. These hop-on hop-off vehicles boast the latest hybrid technology, cutting emissions by half compared to a standard diesel bus. Combined, this means at least 1,000 hybrid buses will be on the Capital's streets by 2016 joined by nearly 1,000 buses fitted with equipment to cut pollution, specifically NOx. Mayor of London Boris Johnson, said: 'I am determined to clean up London's buses to improve quality of life. 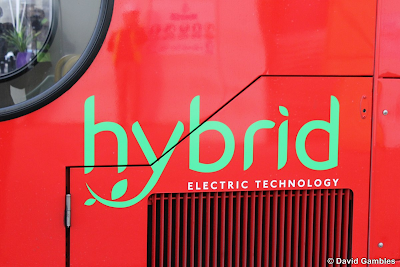 Hybrid technology, which combines batteries, a conventional diesel engine and an electric motor to propel the bus was first trialled by TfL in 2006. Since then the diesel-electric hybrid fleet has doubled year on year reflecting greater confidence with operating hybrid technology and impressive fuel savings and operational performance.